1. Manuscript: The author should submit a complete manuscript including the title page, abstract, text, a list of references, table(s), and figure legends. 2. Figures (separate files in TIF or JPEG format). (1) The corresponding author’s name, postal and e-mail addresses, telephone and fax numbers. (2) The title of the manuscript and a brief paragraph explaining significance of the work. (4) A statement that the submitted manuscript is an original and unpublished work of authors and is not under simultaneous consideration for publication by any another journal. (5) Any conflict of interest. (6) The names, institutional affiliations, and postal and email addresses of 3 or more qualified reviewers. 1. Original articles: Original articles are peer reviewed and report details of original studies that have not been published previously. Generally, Manuscript should be divided into the following sections and appear in the order: (1) Title page, (2) Abstract including Keywords, (3) Introduction, (4) Materials and Methods, (5) Results, (6) Discussion, (7) Acknowledgments (optional), (8) References, (9) Tables, (10) Figure legends, (11) Figures (Illustrations). 2. Reviews: Review introduces the reader to a particular area of an author's research through a concise overview of a selected topic. The content should balance scope with depth, but it should not exceed 10,000 words (excluding references). Reference to important work from others that is significant to the topic should be included. 3. Short Communication: Short Communication is a report of unusual urgency, significance and interest originating in all areas of biological aging and aging-associated disease, which may not exceed 2000 words. An introductory paragraph should explain its significance and the end paragraph may summarize the major conclusions that can be drawn pointing to possible future directions. Manuscripts should be double-spaced, including text, tables, legends and references. All pages must be numbered consecutively from the title page, and include the acknowledgments, references, tables, and figure legends. The title page should carry the following information: (1) the full title of the paper, which should not exceed 120 characters including spaces and abbreviations should be avoided; (2) the full names of all the authors; (3) the name(s) and address(es) of the institution(s) where the work was performed (the present addresses of the authors, if different from the above, should appear in a footnote); (4) the name, mailing address, telephone and fax numbers and e-mail address of the author responsible for correspondence about the manuscript (the 'corresponding author'; this author may or may not be the 'guarantor' for the integrity of the study); (5) a running title, usually no more than 40 characters (including letters and spaces) at the foot of the title page. An Abstract, not exceeding 300 words, followed by appropriate keywords up to a maximum of six, should be provided. The Abstract should provide the context or background for the study and should state the study's purpose, basic procedures, main findings, and principal conclusions. It should emphasize new and important aspects of the study or observations. Provide a context or background for the study. State the specific purpose or research objective of, or hypothesis tested by, the study or observation. The Methods and Materials section should include the methods, apparatus (give the manufacturer's name in parentheses), and procedures in sufficient detail to allow others to reproduce the results. Give references to established methods; provide references and brief descriptions for methods that have been published but are not well-known; Identify precisely all drugs and chemicals used, including generic name(s), dose(s), and route(s) of administration. Describe statistical methods with enough detail to enable a knowledgeable reader with access to the original data to verify the reported results. Describe or summarize the most important findings in logical sequence in the text, tables, and illustrations. Do not repeat all the data in the tables or illustrations in the text. Describe the new and important aspects of the study and explore possible mechanisms or explanations for these findings, compare and contrast the results with other relevant studies, state the limitations of the study, and explore the implications of the findings for future research and for clinical practice. General acknowledgments for consultations, technical assistance, statistical analysis, financial support and such should be listed at the end of the text before the References. Include full names of individuals. All the references must be placed together in a list at the end of the manuscript text. Please note that authors are responsible for the accuracy and completeness of their references. The Uniform Requirements style for references is based largely on an American National Standards Institute style adapted by the NLM for its databases. Text citations: References should be numbered consecutively in the order in which they are first mentioned in the text. Identify references in text, tables, and legends by Arabic numerals in parentheses. References cited only in tables or figure legends should be numbered in accordance with the sequence established by the first identification in the text of the particular table or figure. Freedman SB, Adler M, Seshadri R, Powell EC (2006). Oral ondansetron for gastroenteritis in a pediatric emergency department. N Engl J Med, 354:1698-705. Meltzer PS, Kallioniemi A, Trent JM (2002). Chromosome alterations in human solid tumors. In: Vogelstein B, Kinzler KW, editors. The Genetic Basis of Human Cancer. New York: McGraw- Hill, 93-113. Costa DC, Morgan GF, Lassen NA, editors. New trends in neurology and psychiatry. London: John Libbey; 1993. References to papers accepted but not yet published should be designated as 'in press'. Information from manuscripts submitted but not accepted should be cited in the text as 'unpublished observations' with written permission from the source. Avoid citing a 'personal communication' unless it provides essential information not available from a public source, in which case the name of the person and date of communication should be cited in parentheses in the text. Tables may be placed within the manuscript or sent as separate files (in .doc format). If table is included in manuscript file, place after the References section, one table per page. Number tables consecutively in the order of their first citation in the text and supply a brief title for each. Do not use internal horizontal or vertical lines. Give each column a short or an abbreviated heading. Any abbreviations included in the table should be defined at the bottom of the table. Figure legends should be double-spaced and listed (numbered) on a separate page after the tables. They should not appear on the figures. Include figure titles at the beginning of the legend. When symbols, arrows, numbers, or letters are used to identify parts of the illustrations, identify and explain each one clearly in the legend. Explain the internal scale and identify the method of staining in photomicrographs. Figures should be digital color or black-and-white composites, measuring not more than 6 x 8 inches in a format that will produce high-quality images in the online (i.e. TIF, JPEG or GIF files). Letters, numbers, and symbols on figures should therefore be clear and consistent throughout, and large enough to remain legible when the figure is reduced for publication. Digital graphics should have minimum resolution. Photomicrographs should have internal scale markers. Symbols, arrows, or letters used in photomicrographs should contrast with the background. Figures should be numbered consecutively according to the order in which they have been cited in the text. If a figure has been published previously, acknowledge the original source and submit written permission from the copyright holder to reproduce the figure. Use only standard abbreviations, which should conform to the System Internationale (SI units). The statistical guidelines advocated by the International Committee of Medical Journal Editors (Ann Intern Med 1988; 108: 266-73) should be followed. The spelled-out abbreviation followed by the abbreviation in parenthesis should be used on first mention unless the abbreviation is a standard unit of measurement. A&D is an open access journal, which means that all content is freely available without charge to the user or his/her institution under the terms of the Creative Commons Attribution License. Users are allowed to read, download, copy, distribute, print, search, or link to the full texts of the articles, or use them for any other lawful purpose, without asking prior permission from the publisher or the author. Plagiarism is when an author attempts to pass off someone else's work as his or her own. Duplicate publication, sometimes called self-plagiarism, occurs when an author reuses substantial parts of his or her own published work without providing the appropriate references. This can range from getting an identical paper published in multiple journals, to 'salami-slicing', where authors add small amounts of new data to a previous paper. To help editors verify the originality of submitted manuscripts, selected submitted manuscripts are scanned using the Plagiarism Prevention Software Turnitin and compared with the CrossCheck database. 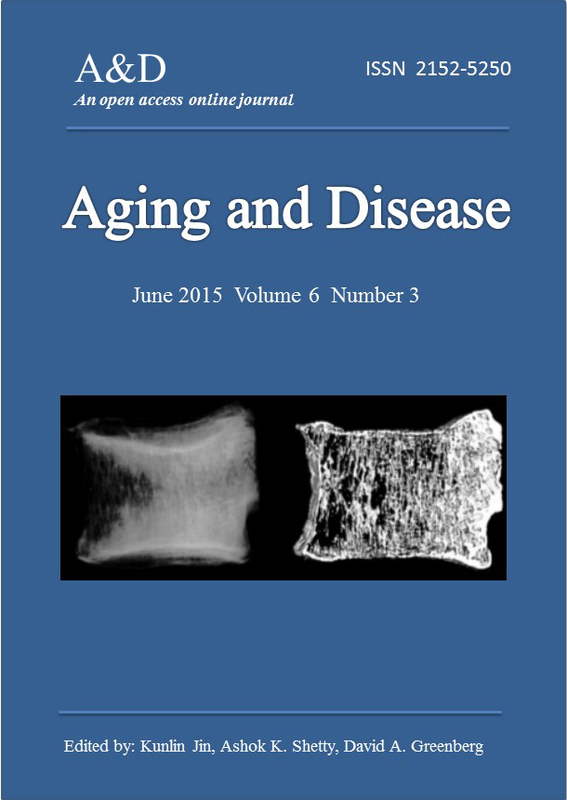 The articles published in Aging and Disease are Open Access. To support Open Access publishing, A&D charges a publication fee ($600-3,000) to offset peer review management, articles convert to XML format, journal production and online hosting, submission system and archiving. The publishing fees are paid either by the author or on their behalf (for example by their institution). Copyright © 2014 Aging and Disease, All Rights Reserved.